The Anakonda has been designed as a traditional Amazonian river boat but its atmosphere and décor are more reminiscent of a boutique hotel. The 18 suites have wall to wall panoramic windows allowing you to lie in large comfortable beds and watch the rainforest glide by. The interior design is distinctly contemporary while the upper observation deck, complete with Jacuzzi, is both a perfect place to watch the jungle or to relax with a drink after a day exploring. 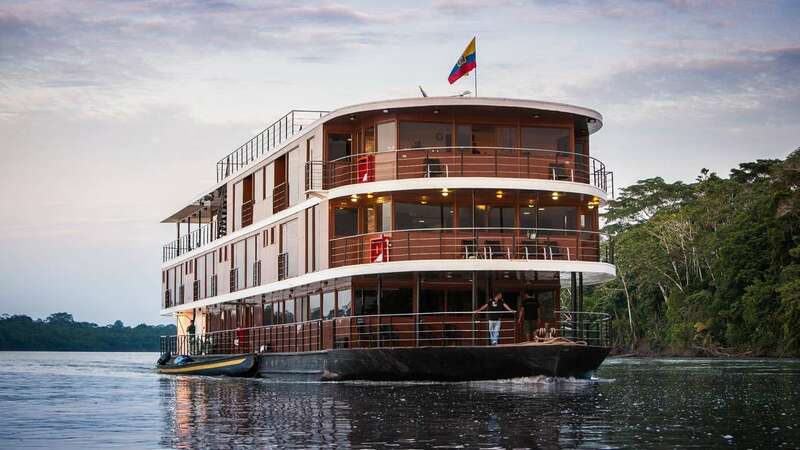 The Anakonda is a delightful boat offering a completely different experience in the Ecuadorian Amazon. There are many reasons to list why we like it. Anakonda offers a very high level of accommodation. The service and food are excellent. Travelling on the river is a lovely way to approach exploring the Amazon. The Anakonda also offers several itineraries including an eight-day trip which allows deeper exploration as far as the Peruvian border. It is also necessary to confess that there is something very spoiling about being able to retreat at the end of the day to an air-conditioned boat and close the door on the heat and humidity of the rainforest. Some activities and sightings will depend on the length of your itinerary on the Anakonda, however all itineraries share similar excursions. A great deal of time is spent on the river in launch boats looking for wildlife and experiencing the Amazon in its entirety. Trekking is also offered and a great way to learn about the forest. Guided night walks are another way to experience a different side to this incredibly diverse environment. The guides on the Anakonda also work closely with the communities of the Amazon, some are native to the area. Meet new cultures, try local delicacies and learn about what it takes to live and survive in the forest. Birding and kayaking are also arranged daily. Four deluxe suites with balconies and 14 standard cabins (four of which are interconnecting and ideal for families). The Anakonda is in the Amazon basin in the northeast of Ecuador. The boat is boarded just outside the town of Coca. All itineraries follow the Napo River which flows through The Yasuni National Park and on into Peru. The eight-day itinerary travels as far as the Peruvian border.